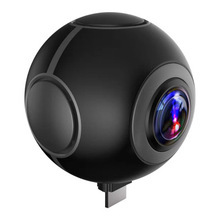 This is a nifty little 360 degree panoramic camera. 360 dgree in horizontal and 220 degree in vertical direction. 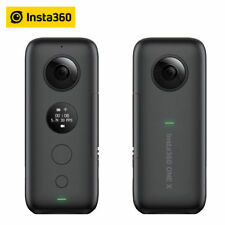 4.0K video and 16MP picture are crstal.It can works in variety ways,such as 360° VR video ,fast capture, continuous shooting and delay photography. 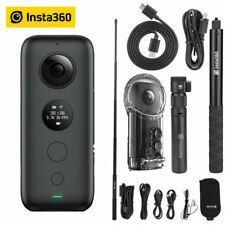 They can meet your needs of different sports scene shooting.. The App(XDV360) is easily downloaded and installed and it can support both IOS and Andriod. 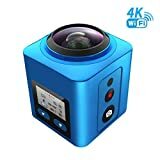 This action camera connects with smart phone through WIFI and it allows you to shoot in several different modes.You can live view it on your phone directly. By converting the video format on PC, you can share it to youtube,facebook and etc. (Video link will be available for how to convert the file format.). Coming with Waterproof case, you can use it for diving or swimming (up to 30m and IP68 waterproof level), which helps catch any motion and detail around you. Good gift for kids and family on holidays and other occasions. It can also work with floating strap (exclude in package)..
Waterproof up to 98' (30m) with rugged waterproof encasing(included in the package) which is designed to withstand extreme environments and conditions.With our Complete and high quality accessories,you can easily make the camera firmly fixed in the helmet, bike and tripod, and self-timer.. 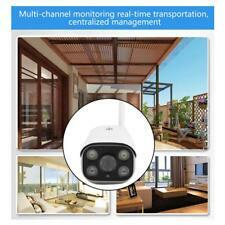 One-year warranty is provided by SEREE. 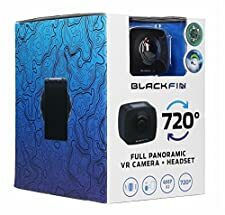 Customer service will be provided within 24 hours in working day; The camera requires a micro SD card and it can support up to 64GB (NOT included). 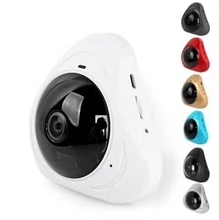 It has durable working hour up to 120 minutes on recording with the 3.7V 1200mAh Li-thium battery..
Main Features: 4.0K 360degree panoramic camera WIFI supported to connect with smart phone Waterproof level is IP68, water-resistant up to 30m/100ft under water. 0.96'' inch High defination Screen. 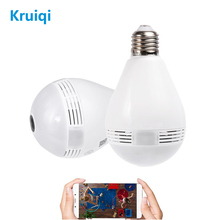 900mAh battery can work more than 2 hours WIFI: android and apple ios device Detailed Spec: Video reoslution: 16mega pixels (4096x4096)/10 mega pixels (2880x2880) Looping video: off/on Time stamp: Off/Date/Date&Time Exposure: +-2.0/+-1.7/+-1.3/+-1.0/+-0.7/+-0.3/0 Burst Phote: 3 photos Time Lapse: 2s/3s/5s/10s/20s/30s/60s Continuous Lapse: off/on Power Frequency: 50Hz/60Hz/Auto Sound indicator: Shutter On/Off, Start Up 1/2/3/None, Beep on/off,Volume 0/1/2/3 WIFI: android and apple ios device LCD Display: 0.96" 128*64 TFT photographed function: Panoramic (5M/8M/12M/16M) Battery: 900mAh battery can work for 90-120 minutes (1080P) WIFI: android and apple ios device, for real time watching Package content: 360 Degree Action Camera x 1 Battery x1 USB cable x1 Charger x1 Water-resistant housing x1 HDMI cable x1 Tip: 1.It's better to be formatted before being used.